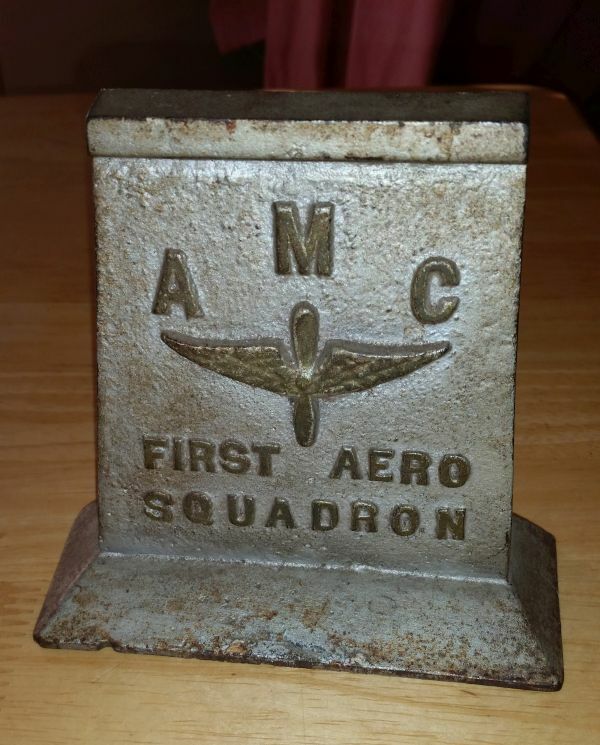 Can you help identify this artifact of the First Aero Squadron? 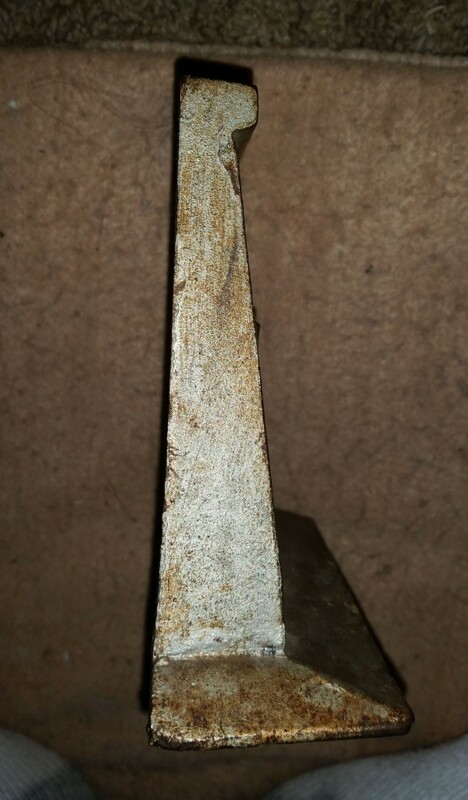 Alert reader Mark Davis sent me photos of this piece after reading my article on the First Aero Squadron in Mexico and wanted to know if I had any idea what this artifact is. 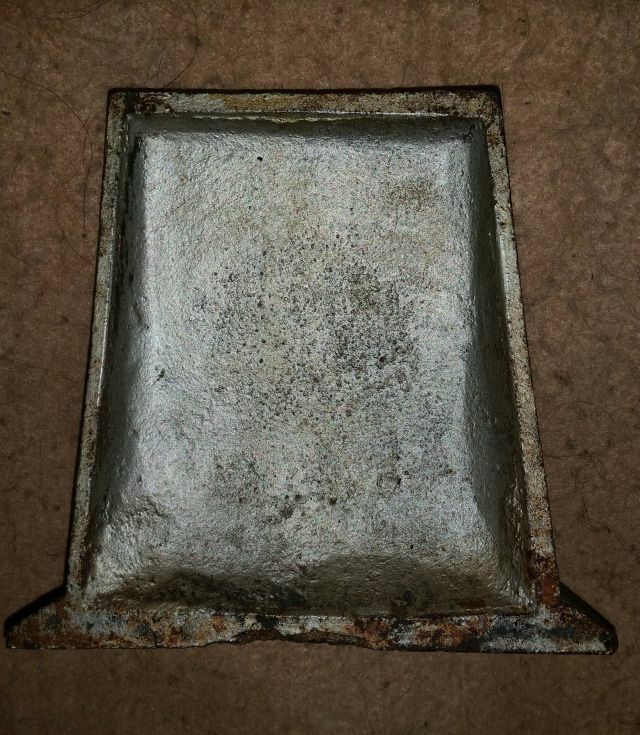 It’s cast iron, about 6 inches tall, 5 inches wide, weighs about 3 pounds, and is hollow in back. – This particular prop and wing emblem was used by Army aviation from 1920 to 1947, so it was probably made after the Mexican Punitive Expedition and World War I. – AMC most likely stands for Aviation Maintenance Company, although it could stand for Air Materials Command (which only existed in 1946-47). Was this used to support something heavy, or was it purely decorative. If you have any ideas what this might be, please leave a comment and I will pass your thoughts on to the owner of the piece. The First Aero Squadron was the US Army’s first aviation unit. It was initially composed of eight Curtiss JN-4 Jennies, and first saw action during the Mexican Punitive Expedition when 10,000 troops under Gen. Pershing hunted for Pancho Villa’s bandits after the Raid on Columbus in March 1916. Learn more about the First Aero Squadron and the Mexican Revolution here. Ed note: The U.S. invasion of Veracruz Mexico in 1914 was precipitated by the Tampico Incident a few weeks earlier, which American authorities viewed as an insult by the Huerta administration. Adding to the tension was word that the freighter Ypiranga was approaching Veracruz with arms for the Huerta administration in violation of an American arms embargo. At 2:00 AM on April 21, President Woodrow Wilson ordered the immediate seizure of the Veracruz customs house, and Secretary of the Navy Josephus Daniels passed the order on to Admiral Fletcher. The battleships USS Utah and USS Florida, accompanied by the transport USS Prairie and the light cruiser USS Chester were already cruising off Veracruz, and Admiral Fletcher was ordered to seize the customs house before the German freighter Ypiranga could unload its cargo of arms and ammunition in violation of the American arms embargo. Fletcher sent an officer ashore with a message requesting that the US consul in Veracruz ask the Mexican government not to resist the landing. In late morning steam launches towed in whale boats loaded with 502 Marines from the USS Prairie and 285 sailors off the USS Florida. They landed at Pier 4 without resistance at 10:20 AM. The Marines fanned out to capture the train station, cable office, telegraph office, power company, and post office without opposition. Meanwhile, the 1st Company of the Naval Battalion advanced from the docks towards the customs house, led by Naval Academy graduate George Lowry. 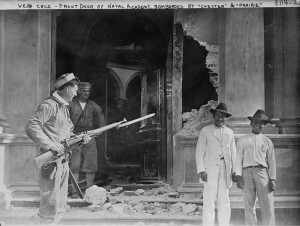 The US sailors reached Calle Emparan, a block from the customs house, when a Mexican policeman armed with a revolver fired on them at 12:30 PM. Ordinary citizens joined with local policemen to resist the invasion, firing from rooftops and street corners. The various landing parties were suddenly engaged in house-to-house fighting against snipers. Lowry’s men took cover in doorways and huddled against the side of buildings as the Mexicans brought two machine guns to bear on Lowry’s command. One gun positioned outside the Naval Academy was withdrawn under fire, but the second gun, firing from an upstairs window in the Hotel Oriente, effectively pinned down the Americans sailors. Lowry and five volunteers dashed into an alley between the customs house and a new, stoutly-built custom’s warehouse. The Hotel Oriente gun and the snipers in the customs house caught Lowry in a crossfire. One of his men was killed and another wounded. Lowry had a button shot off his cap and suffered a minor leg wound, but the others concentrated their fire on the machine gun. Finally, in a scene that could have been taken from a western movie, a Mexican policeman toppled out of the second story window of the Hotel Oriente, and the firing from the machine gun stopped. Lowry’s men climbed through a window into the customs house and disarmed the clerks inside. At the sound of fighting, Admiral Fletcher sent a landing party from the USS Utah, commanded by Ensign Paul Foster (an Annapolis classmate of Lowry). As they approached the customs house, they were fired on from the warehouse. In search of cover, some of the sailors used a railroad rail to break into a building. Foster ordered some of the supplies in the warehouse loaded on several hand trucks, and he used the loaded trucks for cover on the city streets as he pushed his way into the city. Cadets from the Mexican Naval Academy kept up a steady fire aimed at the waterfront and the boats from the Utah. The Marines returned fire with machine guns, killing 15 Mexicans. The USS Prairie and USS Chester pulled close to shore and fired their guns at the cadets, killing many. The US ships destroyed the naval academy and killed large numbers of civilians. At 3:00 PM Admiral Fletcher halted his troops and tried to contact the Mexican government. Two hours later he decided to put his forces on the defensive for the night, while an additional 1,500 troops were brought ashore. By the next morning, the Americans went on the offensive, and controlled the entire city by noon. The worried young pilot flew south, deeper into hostile territory, navigating by the stars. Below the fabric-covered wings of his Curtiss JN-3 “Jenny” darkness had already obscured the unfamiliar landscape of northern Mexico. Lieutenant Edgar S. Gorrell had never flown at night before, and his engine was overheating. The flight had been jinxed from the start. Pre-flight preparations consumed more time than expected, so the eight planes of the 1st Aero Squadron had not taken off until late in the afternoon on March 19, 1916. Not long after they flew south from Columbus, New Mexico, Lieutenant Walter G. Kilner had turned back with engine problems. Navigation errors contributed to the squadron’s problems. Each plane carried a different type of compass, and the aviators were equipped with poor maps. Only one flier, Lieutenant Townsend F. Dodd, had ever made a night flight before. After the sun dropped behind the Sierra Madre, Gorrell lost sight of his fellow pilots and flew on alone. Finally, hopelessly lost, Gorrell turned and headed north again, but his plane had reached the limit of its endurance. With the engine on the verge of seizing up, the young pilot brought the crippled plane in for a rough but successful landing by moonlight. Gorrell knew that he was deep within enemy territory — territory occupied by the mounted and heavily armed followers of Mexican revolutionary General Francisco “Pancho” Villa (the assumed name of Doroteo Arango). He drew his .45-caliber pistol, abandoned his plane and fled into the darkness. Gorrell’s first journey into northern Mexico was typical of the fate awaiting the pilots of the First Aero Squadron, the only American air unit to fly in combat prior to World War I. The outbreak of World War I during the summer of 1914 first revealed the inadequacy of America’s military aviation program. At the war’s outset, the entire air force consisted of 12 officers, 54 men and six planes. At the same time, dozens of British, French and German airmen fought daily over the trenches of the Western Front. Although the numbers of U.S. men and aircraft tripled in the next year, then tripled again, the 1st Aero Squadron remained America’s sole operational air unit until 1917. Mechanics in Columbus replaced the engine in Kilner’s plane the following morning, and he flew to Casas Grandes without incident. Upon landing, he found to his surprise that he was the first to arrive. He then took off and flew 10 miles to Pershing’s headquarters at Colonia Dublan, where Foulois and the three others who had landed at Ascension soon appeared. Willis walked in the next day, and a detachment was sent out to salvage his plane. (The salvage party was fired on but eventually recovered some parts of the plane.) Meanwhile, Gorrell remained missing. Gorrell stumbled around until dawn after abandoning his plane in the dark. Then he approached a remote ranch, intending to steal a horse. Pistol in hand, the airman confronted a mounted Mexican. Gorrell offered the terrified man $8 to guide him to the nearest American troops. The guide was none too eager, knowing that Villa’s men would kill him if he were discovered helping an American, but the pistol in the young pilot’s hand persuaded the Mexican. Gorrell’s reluctant savior carried the airman 20 miles to a column of U.S. cavalry at Ascension. Gorrell rested for a few hours, then borrowed a Ford sedan from the U.S. 6th Infantry. He drove back to his crippled plane with fuel and oil and managed to start the engine. He flew the plane 30 miles south to Ojo Federico, where he landed near an American truck convoy. He refueled, but as he taxied for takeoff, his wing struck a fuel barrel. Once he was airborne, the canvas began to rip from the wing. Gorrell brought his plane down once again and hitched a ride to Colonia Dublan, where he finally rejoined his squadron. Two days later he returned to his plane, repaired it and flew it back to headquarters. While Gorrell had been wandering through the rough country of Chihuahua, the other fliers of the 1st Aero Squadron were assigned to locate American troops advancing south along the Mexico Northwestern Railway. Lieutenant Dodd, with Foulois in the observer’s seat, flew toward Cumbre Pass. Foulois reported that “the plane began to buck and shake violently in ever-increasing turbulent air. We had the throttle on as far as it would go, and the engine was straining valiantly at its limits. Ahead, the ground rose abruptly above us, and I knew that much as Dodd and I wanted to complete our mission, we had reached the absolute ceiling of our plane. We had no choice but to return to headquarters and report our failure.” Discouraged, they returned to Colonia Dublan. One of the squadron’s Jennys, piloted by Lieutenant Thomas Bowen, was caught in a gust of wind during takeoff later that same day. Bowen was injured in the ensuing crash and the Jenny was destroyed, leaving the squadron with only six functional planes (including Gorrell’s still-missing craft). Over the next several days, the fliers again tried to push the JN-3s over the mountains, but the 100-hp engines were not powerful enough. After only a few days of operations, it became clear that the JN-3s (which had been designed as trainers) could not fly over the 12,000-foot-high mountains, nor could they withstand the gusty winds, rain, hail and snow that were prevalent in the area. There were other problems with the planes as well. Their wheels bogged down in the deep sand, and the hot, dry air quickly dried out the wooden planes. Especially troublesome were the propellers, which delaminated in the dry heat. Metal propellers were too heavy for the underpowered engines, and only a propeller laboriously carved from dried native wood proved successful. The pilots soon learned to carry a spare propeller, stored in a humidity-controlled box strapped to the side of the fuselage, on every mission. Utecht, who had not submitted his work to the censors, was kicked out of Mexico, and Pershing’s inspector general questioned all the officers of the squadron. With an eye on their careers, the fliers denied the quotes attributed to them. The squadron’s mechanics — some of whom used motorcycles to quickly reach a downed aircraft — did all they could to strengthen the Jennys for use in Mexico, but there was only so much that could be done. After several abortive attempts to cross Cumbre Pass, the 1st Aero Squadron concentrated on carrying mail and dispatches between Columbus and the columns moving south into Mexico. In this capacity, the squadron proved to be successful. During the last few days of March, the six remaining planes flew approximately 20 missions with messages for the various columns of Pershing’s command. The planes were moved to Namiquipa beginning April 1, 1916, where 19 missions were flown on one day without a problem. Foulois knew that his aircraft could not long withstand the rigors of desert flying, and he devised a plan to conserve the remaining planes. He suggested that a radio-telegraph link be established between Casas Grandes and Namiquipa, and that motorcycles be used for routine message traffic. The planes would be reserved for emergency use. He also requested 10 new planes capable of performing in the adverse conditions of Mexico, but he was informed that all available aircraft were already with the punitive expedition. The squadron moved to San Geronimo on April 5. Just a day later, Kilner’s plane landed too hard, tearing off a wheel. The JN-3 ground looped and was destroyed. The squadron was down to five planes on the eve of its most important and hazardous mission. Early on April 7, 1916, two planes took off and flew from San Geronimo to Chihuahua. One was piloted by Dargue, with Foulois sitting in the observer’s seat. Carberry was at the controls of the other plane, accompanied by Dodd. The two planes flew to Chihuahua City with identical messages for Marion H. Letcher, the American consul in that city. Carberry landed north of Chihuahua and Dodd set off with the message for Letcher, while Dargue landed south of the city. Foulois exited the plane, then ordered Dargue to fly north and rejoin Carberry. Foulois started into town, but as Dargue’s airplane was climbing, he was fired on by four mounted Mexican policemen armed with Winchester rifles. Foulois heard the shooting (the first recorded attack against an American military plane) and intervened. The Mexicans stopped shooting but trained their weapons on Foulois, who later said of the episode, “There was nothing I could do but put my hands up — and pray.” Surrounded by bystanders shouting “kill the gringo,” Foulois was carted off to jail. Dargue and his plane were unhurt by the gunfire, and a few minutes later he landed near Carberry’s plane, where an angry crowd of Carranza supporters had gathered. The Mexicans, indignant about the American incursion into their country, began to vandalize the two planes. They burned cigarette holes in the wings, cut the fabric and removed a number of nuts and bolts from the aircraft. In desperation, the two pilots started their engines. The enraged crowd threw rocks as the aviators lifted off. Carberry managed to fly to an American-owned smelter six miles away, but Dargue’s plane was struck by one of the stones and the stabilizer was damaged. Dargue brought the crippled plane down safely but was immediately surrounded by the hostile crowd. Meanwhile, even though he had been dragged off to jail, Foulois managed to contact a Colonel Miranda of the Mexican army, who released the airman and escorted him to the military governor of Chihuahua, General Eulallo Gutierrez. Gutierrez ordered his troops to help Foulois find Dargue. When Foulois and his escorts arrived, Dargue was doing his best to hold off the angry mob, armed with no more than his wits and bare hands. Dargue’s plane was repaired later that afternoon, and the somewhat shaken airman flew back to San Geronimo. 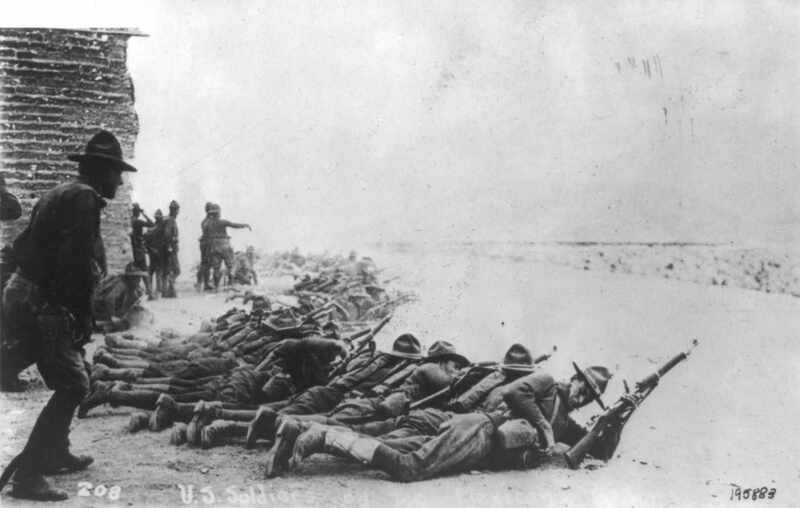 American troops fire across the border at Mexican revolutionaries. The incident revealed the unpopularity of the American intervention among Mexicans of every political persuasion. Indeed, the airmen of the 1st Aero Squadron felt the anger of the populace on more than one occasion. On the following day, April 8, Mexicans fired at Carberry and Dodd as they flew over Chihuahua. Lieutenant Carlton G. Chapman made a forced landing that same day at Santa Rosalia, where he was captured by Carranza supporters. He was eventually released, but not before looters stole field glasses, goggles and ammunition from his plane. Carranza’s forces, led by Minister of War Alvaro Obregon, did not initially resist U.S. intervention. But it wasn’t long before the Mexican president, a strong nationalist, became increasingly concerned about the American presence in his country. Fearful that some of his military commanders might defect to Villa, Carranza began to demand that the Americans return home. Carranza’s troops resisted Pershing’s forces on several occasions. One of the worst clashes occurred on April 12, 1916, at Parral, when American cavalrymen fired on a hostile crowd of Carrancistas. Two soldiers were killed, as were a large number of Mexicans. That afternoon, Foulois carried an ultimatum from a furious General Gutierrez to Pershing, demanding the withdrawal of U.S. troops. A defiant Pershing scribbled a reply that he would withdraw when he was ordered to do so by the U.S. president or the secretary of war, which Foulois carried back to Chihuahua City. (The wings of Foulois’ airplane were damaged during that flight and were replaced with the wings of one of the remaining planes, leaving the squadron with only four aircraft.) The Wilson administration was having second thoughts about the punitive expedition, and Pershing was ordered to halt operations while high-level officials conducted talks on the situation in Mexico. Dargue and Gorrell took off on a reconnaissance mission to locate a force of Carrancistas on April 14. They flew 315 miles, an unofficial American distance record at the time. Lieutenant I.A. Rader undertook a similar mission on that day but was forced to land at Ojito, nearly 100 miles from the nearest U.S. force. He abandoned his plane, leaving the squadron with only three planes. Five days later, Dargue and Willis undertook another scouting mission to Chihuahua City. They carried a new Brock aerial camera capable of making sequenced photos, but they experienced engine trouble 20 miles northwest of Chihuahua and crashed in the woods. Dargue was unhurt, but Willis was temporarily pinned in the wreckage and suffered a broken ankle and a severe scalp wound. The plane, the camera and the photographic plates had all been destroyed in the crash, so Dargue set fire to the wreckage. In the dry conditions, the surrounding forest caught fire, and the conflagration raged out of control, consuming thousands of acres of countryside. The two men escaped the flames and began to walk to San Antonio, Willis hobbling on his broken ankle. After traveling 40 miles, they stole a mule and rode the remaining 25 miles into San Antonio. While Rader, Dargue and Willis were walking home, the remaining two JN-3s and the rest of the squadron were sent back to Columbus for refitting. The fliers arrived on April 20, 1916, and found four new Curtiss N-8s, an export version of the JN-4, the latest model of the Jenny. These were the first of 94 JN-4s ordered by the Army in 1916 (the JN-4 soon became the standard U.S. trainer). The aviators tested their new planes during the last week of April and found them lacking. Foulois was particularly unimpressed. He condemned the N-8s at first glance, then set fire to the two surviving JN-3s for good measure. Despite his wanton destruction of government property, Foulois was promoted to major. The airmen complained so bitterly about their new planes that the N-8s were quickly withdrawn from the border and sent to San Diego, where they were used for training and experimentation. The Technical Aero Advisory and Inspection Board of the Signal Corps decided instead to equip the 1st Aero with the Curtiss R-2, which boasted a 160-hp engine. Twelve R-2s were delivered to the squadron in May, but the planes, which had been very hastily constructed, were missing vital spare parts and had faulty wiring and leaky fuel tanks. The aircraft even lacked compasses, instruments and tool kits when they arrived. The experienced mechanics at Columbus soon put the planes into flying shape, however. The R-2s used in Mexico were eventually equipped with automatic cameras, radios and Lewis machine guns, as well as incendiary and explosive bombs (the weapons were never used in Mexico). Despite the use of airplanes, the U.S. Army never managed to locate the elusive Pancho Villa. Instead of easing tensions along the Mexican border, the U.S. incursion only further inflamed the situation. In late June, a clash between an American patrol and a force of Carrancistas left 12 Americans dead and another 23 as prisoners. 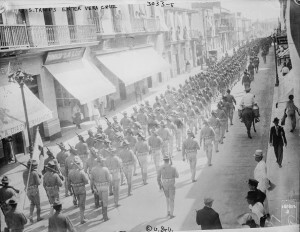 Anti-American demonstrations occurred throughout Mexico, and Pershing was informed by the Carranza government that his movement in any direction but north would be resisted. Although more U.S. troops continued to pour into Mexico, the services of the 1st Aero Squadron were needed less and less after reliable ground communication links were established. The pilots of the squadron flew 540 missions in Mexico between March 15 and August 15, 1916. The average mission length was 36 miles. The squadron’s greatest contribution was maintaining communications between Pershing’s columns, which penetrated 700 miles into Mexico. As the summer of 1916 turned to fall, the U.S. military began to worry less about Pancho Villa and more about the war in Europe. The last U.S. troops left Mexico in February 1917, just two months before the United States entered World War I. Although the 1st Aero Squadron remained at Columbus until August 1917, most of the experienced fliers were transferred to several new squadrons being formed. Major Foulois rose rapidly through the ranks and soon commanded the U.S. Air Service of the First Army during World War I. General Black Jack Pershing also had a new command, but before leaving the border area to take charge of the U.S. Expeditionary Force in Europe, he thanked the 1st Aero Squadron for “the faithful and efficient service it has performed as part of this expedition.” On August 5, 1917, the 1st Aero Squadron, commanded by Major Ralph Royce, left Columbus for the Western Front. 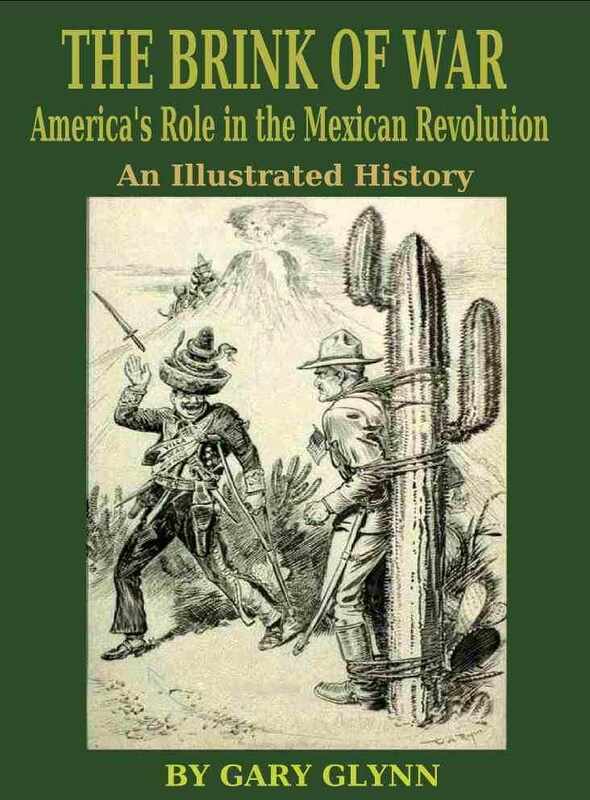 More information on The Brink of War, Gary Glynn’s upcoming book on America’s role during the Mexican Revolution, can be found here. Can you identify this artifact of the First Aero Squadron?